I was hoping to see this happen: Just last month, Congress voted to significantly roll back many of the Dodd-Frank regulations. Of course, not everyone is in agreement as to what should be kept and what should be rolled back, because, like always, there are at least two sides to every story. 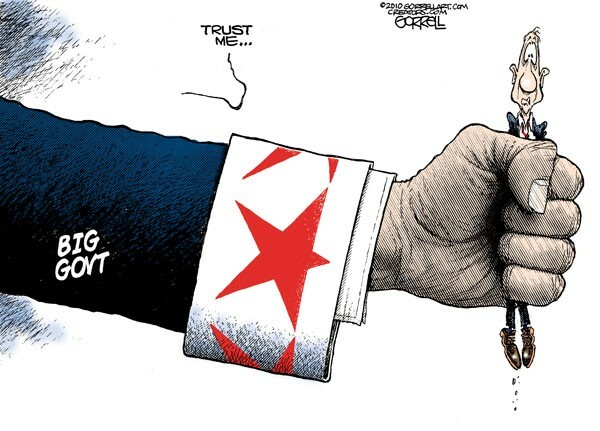 “Trust me!” says the government. The Dodd-Frank Act, a federal law created in 2010 by the Obama administration in response to the 2008 financial crisis, imposed greater restrictions on banks, placing the regulation of the entire financial industry in the hands of the government. What really struck me as I read through this New York Times article about the Dodd-Frank rollbacks is the growing divide within our political system. I’m sure most of you have noticed that virtually every political or social issue in the news is accompanied by staunch partisan viewpoints – and, even within the parties, stances are mixed. This issue is no different. But, overall, there are two camps: One side thinks the government knows best and should be “large and in charge.” The other side believes it’s better to let the free market self-regulate, operating outside of the clutches of government intervention. Theoretically, we all know that the answers lie somewhere in between. But it’s hard not to get fired up and stick to our guns when we read an article or watch a story that pushes our core belief buttons. Where do you tend to stand? Free market? Or government knows best? You see? One camp believes in the American people, and that, of their own accord, businesses in the free market will naturally make the decisions that promote and reward good policy while punishing the bad. The other camp believes that the market is incapable of functioning on its own without the brilliant input from elected officials and that the government knows best and should regulate as it sees fit. However, when the government removes a portion of the free market trade, it usually just makes it worse. The government will never be able to both control the free market completely and have it prosper. The market can only be controlled for so long; eventually, it will do what it will do, regardless of government intervention. This happened in our last big recession: It was a complete economic reset, and a painful one, at that. The markets that were able to reset with little-to-no government intervention recovered much more quickly; markets that were underneath the government’s thumb took much longer to recover. Some still haven’t recovered to this day! Since government intervention within the marketplace is an extremely complex and far-reaching issue, I don’t think any of us can pretend to know all the answers. What it comes down to, though, is that thousands of banks, businesses, and livelihoods are affected by these decisions made by people and entities who have no clue what might be good for a local economy. How is a beltway bureaucrat supposed to understand how the banking business works in our Biggest Little City of Reno, Nevada? Can the government possibly set good policy that fits the needs of millions of U.S. businesses and citizens? No way. Heck, I screw up setting policy within my own company, and we only have a 20-person team. And, I know it inside and out. Check out the article below to learn more. WASHINGTON — A decade after the global financial crisis tipped the United States into a recession, Congress agreed on Tuesday to free thousands of small and medium-sized banks from strict rules that had been enacted as part of the 2010 Dodd-Frank law to prevent another meltdown. The bill stops far short of unwinding the toughened regulatory regime put in place to prevent the nation’s biggest banks from engaging in risky behavior, but it represents a substantial watering down of Obama-era rules governing a large swath of the banking system. The legislation will leave fewer than 10 big banks in the United States subject to stricter federal oversight, freeing thousands of banks with less than $250 billion in assets from a post-crisis crackdown that they have long complained is too onerous. Republican lawmakers and the banking industry cheered a measure they said would help unshackle banks — and the economy — from regulatory burdens. The push to alter even a portion of Dodd-Frank so soon after the crisis and just ahead of the midterm elections has pitted Democratic lawmakers against one another. Party leaders are eager to present a united front to voters in November and are wary of losing a signature issue — holding Wall Street accountable. The Dodd-Frank bill was a Democrat-led initiative that passed with the support of just three Republicans and it has been under constant attack from Republicans ever since. Left-leaning lawmakers like Senator Elizabeth Warren of Massachusetts and Senator Sherrod Brown of Ohio have blasted their more moderate colleagues, like Heidi Heitkamp of North Dakota, for supporting the legislation, and Democratic leaders have tried to prevent any lawmakers from crossing the aisle to support the bill. Ms. Pelosi and Representative Maxine Waters of California, the ranking Democrat on the House Financial Services Committee, wrote a letter to their House colleagues urging them not to support the bill. “We must not allow the G.O.P. Congress to drag us back to the same lack of oversight that ignited the Great Recession,” they wrote. The overtures did not prevent several Democrats from crossing party lines in favor of the legislation — 33 Democrats voted for it, and one Republican, Walter B. Jones of North Carolina, voted against it. Democrats have pointed to record profits on Wall Street, saying banks do not need relief from rules given how flush they are with cash. A report from the Federal Deposit Insurance Corporation on Tuesday said that the combined net income of the nation’s commercial banks and savings institutions reached $56 billion in the first quarter of 2018, a 27.5 percent increase from a year ago. Once the bill is signed by Mr. Trump, small and medium-sized banks will no longer be required to undergo “stress tests” aimed at measuring their ability to withstand a severe economic downturn. The legislation also offers a reprieve to big — but not behemoth — banks, allowing large institutions like American Express and BB & T to no longer be deemed “systemically important” and subject to stricter oversight. The bill also exempts some loan originators, including small lenders, from certain disclosure requirements under the Home Mortgage Disclosure Act. Democrats say this will open the door to discriminatory practices because the rules required collection of credit scores, loan amounts and interest rates in an effort to expose redlining and lending discrimination. While the legislation does little to help the very largest banks like JPMorgan Chase, Goldman Sachs and Citigroup, the Trump administration has been working behind the scenes through its regulatory agencies to weaken capital requirements and ease other restrictions on such firms. Later this month, five regulators are expected to release a plan to water-down the Volcker Rule, which bans banks from making risky bets with depositors’ money. Regulators have already proposed easing limits on how much the largest banks can borrow, a change that was opposed by Obama administration appointees at the Fed and the Federal Deposit Insurance Corporation, who argued it was too soon to reduce capital requirements for the biggest banks. And the Consumer Financial Protection Bureau, which is run by Mr. Trump’s budget director, has halted the agency’s continuing investigations into finance companies. Republicans saw Tuesday’s vote as merely the beginning, not the end, of the Dodd-Frank legislative rollback. For years, House Republicans have been pushing for a more significant overhaul of Dodd-Frank and last year passed the Financial Choice Act, which would have crippled the consumer bureau and revoked the Volcker Rule. However, that bill stood no chance of gaining Democratic support in the Senate and Republicans, looking to score a victory before the midterm elections, ultimately chose the pragmatic path of approving the bipartisan Senate legislation. Republicans, and some Democrats, say that the Dodd-Frank law has unnecessarily hurt small- and medium-sized banks that did not play a role in the financial crisis and have been collateral damage in Washington’s campaign to corral their bigger brethren. They say the regulations have cut off the flow of credit to many Americans who depend on smaller banks for business and personal loans. Representative Jeb Hensarling of Texas, the Republican chairman of the House Financial Services Committee, said the bill was a victory for Americans who depend on small banks and credit unions. “The Main Street banks and credit unions that these people depend on, they’ve been suffering, they’ve been suffering for years under the weight, the load, the volume, the complexity and cost of heavy Washington bureaucratic red tape,” he said. Mr. Hensarling said he remained hopeful that the Senate would consider some of the other, smaller deregulation bills that the House has passed, but their fates remain uncertain. Aaron Cutler, a former senior policy adviser to House Republicans and now a partner at Hogan Lovells, said the bill was just a first step. “Hopefully this is the first of many legislative pieces to come that improve financial regulations,” he said. Conservative groups that have been strong opponents of Dodd-Frank say more must be done to fix the regulatory overreach created by the crisis. To those who lived through the financial crisis, the deregulatory efforts have prompted concern. Sarah Bloom Raskin, who was deputy Treasury Secretary during the Obama administration, said she was worried about the cumulative effect of the Trump administration’s deregulatory efforts. She said that there has been a troubling lack of economic analysis about the policies that are being put in place. “Overall resilience is being weakened in unexamined ways,” Ms. Raskin said. Senior White House officials said after the bill passed that they hoped to get it to Mr. Trump’s desk for signing before Memorial Day. While they would not say that it fulfilled the president’s promise of repealing Dodd-Frank, they called it an important step toward ridding the economy of regulations that have held back growth.